Old vineyard classic full of authentic/rustic cottage charm in perfect location 100 steps to famous inkwell beach.. House has original Victorian cathedral windows, doors and decor. Major renovation in 2016 brings new kitchen, new laundry room and two new bathrooms. Side deck connecting kitchen to outdoor dining area, landscaped lawn and lighted outdoor dining area added in 2016. Perfect in-town location - rare to find an original historic classic that is completely renovated AND across from beach. One of the original and oldest Carpenter Gothic houses in Oak Bluffs. A friendly beach loving neighborhood, great for families that want to spend their days at the beach and communing on the porch/lawn. The porch has ocean/inkwell beach views and outdoor seating - outdoor breakfast nook (4), rocking chairs (2), wicker sofa (2) and wicker chairs (3). The beach cottage has 5 bedrooms and comfortably sleeps 10 people. The renowned inkwell beach is steps away with the charming oak bluffs harbor, ferry and quaint main street (restaurants, shopping) just a 5-6 minute stroll way. The house is on a quiet street in a central location with newly rebuilt Niantic park tennis courts, new playground and basketball courts right down the street. The Big Park (Waban Park) is right behind the house perfect for flying kites on the ocean breeze or kicking around a soccer/football. The spacious house has 5 bedrooms with high speed internet, DVD and Cable TV. Please note if you are planning on hosting an event please contact us first for written permission for any events or gatherings with more than 15+ people. Outside Dining & Porch: If your family and friends love living outside and walking back and forth to the beach then look no further. The house is literally 50 steps away from Inkwell beach. We have plenty of lounge areas - our side yard (afternoon sun) includes a large outdoor table (seating for 10) with a large umbrella, lounge chairs, porch breakfast table with morning sun, porch sofa, porch rockers, beach chairs, beach towels and comfy lawn chairs. The large porch wraps around to allow shade seekers on the porch to easily converse with sunbathers in the garden. There are beds of roses, hydrangeas and flowers to enjoy. In addition, there is a gas grill. In 2016, we have all brand-new appliances in the kitchen include gas stove with electric convection baking oven, extra large double door fridge, extra large washer & dryers. With a brand new on demand hot water heater and new electrical wiring in 2015-2016, everyone can take hot showers while doing laundry and the dishwasher. In addition - TV, DVD and Wi-Fi on the property. Sleeping Well: While we believe it is the ocean breeze that gives you such a good nights sleep here, we also have high quality mattresses, pillows, blankets and linens in all the bedrooms. In the two master bedrooms, the pillow-top mattress are covered in 600-1000 count cotton sheets for maximum comfort. In addition, each master bedroom has an iPOD/iPHONE *adapters for the new iPhone 6 available* music docking station for those of you who want to hear your favorite tunes while you drift off to sleep or get up early to watch the stunning ocean sunrise. This is our home and we are happy to invite you to enjoy it. We ask you to treat this home like your own, with care and appreciation as one of the oldest homes in Oak Bluffs. We are a family of four with two young children. I grew up in New England, and the vineyard was always a magical summer place for me. My husband grew up in the mountains of Italy, but once he visited to the vineyard, he also fell in love. The moment we walked into this house, we knew our search for our summer home was complete. We are pleased to share the laid-back charm and unique island spirit the vineyard has to offer with a select families each year. The Copeland / Inkwell neighborhood has a rich history. It is a friendly neighborhood, with families that have been "summering" for generations. It is a house best suited for families or close groups of friends looking to enjoy a beach holiday with the unique charm of summer vineyard living. A change of pace from busy modern life. Connect, recharge and relax your on the vineyard. We were looking to find a house that had retained it's original charming victorian architecture -- a place where you could literally smell the ocean. We haven taken care to maintain the original feeling and power of the place while modernizing the kitchen and bathrooms. We worked with a local architect and the local historic commissions to make the beach house more comfortable for our family and guests. We love to cook, so the kitchen and bathrooms were completely remodeled in 2016, with all new appliances. As one of the oldest homes in the district, the house is a living treasure and monument to the seaside charm and the resort days of Victorian New England The island is a place to refresh, renew and retreat from the modern life and pace of the main land. There are no Starbucks, no chain restaurants, no traffic lights. It reminds us of a slower time when we found the time to connect with each other and the beautiful nature around us. The house has been with only a handful of families since it was built and we consider ourselves proud caretakers of a tradition that will be around for many more generations to come. It is quintessential rustic vineyard cottage living and we hope you love it as much as we do. You can wake up and see/hear the ocean from the master bedroom. The porch is big and welcoming for afternoon chats. The yard perfect to invite family & friends for lunch/BBQ/teatime. In minutes, walking through the historic district or along the beach, you can fly a kite, take the kids to the playground, play a game of tennis or pick up ice cream or baked deserts. The water and sunrise is an important element of your vacation backdrop, as you live your whole day under the blue skies. The location allows for a morning stroll to the harbor along the beach, or a 10K bike ride in between the sand dunes, or a quiet moment to sit on the big rock and watch the ocean horizon. For us, it is the hard to find, perfect in-town location, friendly neighbors and right at the beach. It is quite simply - a wonderful place to be. A full bath and shower downstairs new 2017. A walk in tiled shower upstairs new in 2016. The inkwell beach ready for great swimming and fishing across the street. The harbor and ferry are about 5 minute walk along the beach road. Located in Oak Bluffs, in the Copeland Historic District. The town park, tennis courts, playground are just up the street, and Circuit Ave (main street) in 5 minutes away. Enjoy! Located in the heart of the copeland historic district you are in an old resort area with families that have been enjoying the ocean for generations. The inkwell beach is viewed from the front porch and the master bedroom. The ocean, beach and horizon is your backdrop. You are going to be gazing on the beach most of your vacation.. The inkwell beach is literally right down the street. Just 100 steps and you are at the beach and in the ocean. The inkwell beach is across the street with the atlantic ocean at your doorstep. The inkwell beach ready for great swimming and fishing across the street. The harbor and oak bluffs ferry terminal are about 5 minute walk along the beach road. There are room heaters available but this house in not winterized and closed down in the autumn. We open again in the spring. It is a summer seaside cottage. Yes, we provide bed linens and towels for guests. Yes, we have a washer and dryer that are new in 2016. We have a sofa, chaise lounge and wicker seating chairs. Comfortable seating for 8 guests. Yes, we have a microwave. We start the season with high-quality staples in the pantry - seasoning, island sea salt, honey, organic oil and vinegar, italian coffee and herbal teas. Seating for 10 comfortably, 10 dining room chairs, 2 indoor arm chairs, 2 high chairs in house. Yes, we have a TV in the living room of the main house with cable, and a built in DVD player. Yes, there is an extensive selection of books throughout the house - living room, master bedroom. There is also a small selection of youth and children books in the loft room. No library but sonos speakers in the house that you can connect to your phone or computer. Yes, there are a selection of outdoor games, and board games in the downstairs bedroom closet and in the coffee table downstairs. In addition, there are kites, frisbees and balls. Master Bedroom has private balcony with ocean and beach views. Kayaks, speedboats, jet ski and guided fishing tours available at harbor or at State Beach. Kayaks, speedboats, jet ski and guided fishing tours available at harbor or at beach. The town tennis courts are just up the street. You can book directly with town or at court side. Children playground also at the same park. The house was beautiful and the location was perfect:) The house manager was really flexible about our check in and check out times as we were subject to ferry times. Would love to rent again. Second stay was as wonderful as the first. Clean, comfortable place with thoughtful touches and conveniences. The Polar Bears welcomed us to their daily 7:30 am swim at Inkwell Beach, and we made new friends. Wonderful outdoor table, grill, and freshly planted lawn. We would have appreciated working bikes, but we made good use of the beach chairs and umbrella. Beautifully restored and well furnished and decorated historic house in a great location. Couldn't ask for more. Not only is the house itself fantastic, the owner goes the extra mile. Went out of her way to make beach toys were made available for out grandson. Sheets and towels are supplied (a real rarity). The yard is beautifully landscaped and well-maintained. (Lush hydrangeas surrounding the porch really enhance make porch-sitting even more enjoyable.) Two properties away from the beach and a short stroll into town. Close to the bike path to Edgartown and "Jaws beach and bridge" (a big hit with the teenagers). Five minutes to Farm Neck Golf Club. Something for everyone of all ages. All our guests raved about the house. So do we. My family first visit to Oak Bluffs On Martha's Vineyard. What a lovely experience all around. Although we arrived way to early for check in, I spoke to the house manager who did her best to accommodate us. When we finally arrived to the house, it was spotless. All we had to do was unpack and go food shopping. The home had such charm unique to the historic Oak Bluffs. We enjoyed the porch every morning as well as the side yard. We took advantage of the beach chairs provided my the owners every opportunity we could. We bought a kite for our 5 year old only to realize that Claudio and Katina already had toys there. One of the conveniences of this home is that if you have elderly parents, there are twin beds with a full bathroom on the first floor. The kitchen appliances are all new and up to date. I can't say enough about our experience or the lovely home. Claudio and Katina answered all our concerns immediately or in a timely fashion. We can now say that MV will be our new family get away every year. We loved our stay at this house. We were four adults and four children under 6yo. There was plenty of room for everyone. The house was clean and the kitchen was stocked. We were able to make all our meals home cooked. The yard is lovely and the beach is under one minute walk. The walk to downtown OB is under 10 minutes, and there is a great playground for kids a couple blocks away. Can't say enough about the location. Again, a beautiful house in a great location. We would happily stay again. 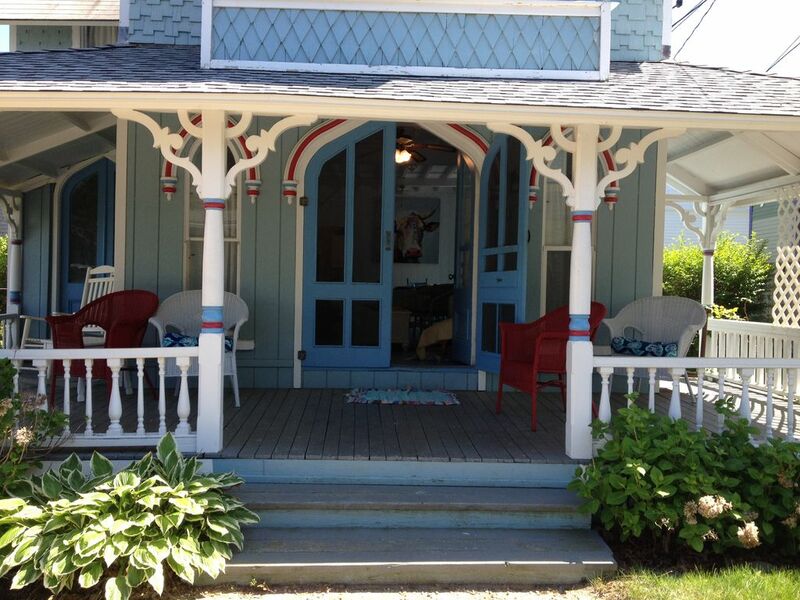 Old Victorian Seaside Charm - Sit on the big porch and gaze at the famous inkwell beach (just steps away!) Wake up in the Master Bedroom (King Size Bed) with direct ocean views from your bed or private balcony. Nestled in the heart of the historic district and just a few minutes walk to town, shops, harbor or the ferry. There are five bedrooms with a full bath downstairs, a newly renovated bathroom with tiled shower upstairs, a newly renovated kitchen/laundry room and bathroom. An outdoor shower to wash away a day at the beach. The beach bike path starts right at our doorstep - with paddle-boarding, kayaking, clamming all nearby. Two around town bikes available for use (use helmets please!) Just up the street are the neighborhood tennis courts, basketball court and new children's playground. High speed Wi-FI for both properties, as well as extensive book library, DVD and family board games. We welcome you into our home to truly enjoy life at the island pace. Golf just a few minutes away: Golf the links while overlooking the Nantucket sound. Challenge your swings with the ocean breezes and the incomparable beauty of the the island.